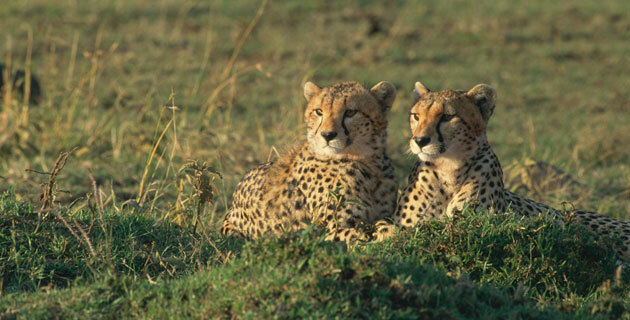 “On safari” … it’s one of the most alluring phrases in all of travel. And Kenya and Tanzania count among the most alluring places to be “on safari.” As our small group travels from grasslands to highlands, to reserves and national parks, we enjoy intimate game drives, see stupendous landscapes, stay in excellent accommodations, and meet gracious local people. Day 2: Arrive Nairobi After arriving in Nairobi, we transfer to our hotel. As arrival times may vary greatly, we have no group activities or meals planned. Day 17: Arrive U.S. We reach the U.S. today and connect with our flights home. Please call if your city is not listed or for land only prices. Prices are per person based on double occupancy and include airline taxes, surcharges, and fees of $801, which are subject to change until final payment is made. Single travelers please add $1,795 Jun-Oct; $1,295 all other dates. Your $375 deposit is fully refundable up to 95 days prior to departure. All 2019 tour prices above (excluding airline taxes, surcharges, and fees) are guaranteed. One of Nairobi’s most popular hotels, the 165-room Fairmont The Norfolk has been a center of city life since its founding in 1904. The Tudor-style hotel with a traditional safari atmosphere sits in private tropical gardens a short distance from the city center; it was renovated in 2004 in honor of its centennial. Hotel amenities include six restaurants (including the renowned Lord Delamere Terrace & Bar); health club with fitness facilities, spa, sauna, and steam room; heated outdoor pool; business center with internet access; and laundry and dry cleaning services. Air-conditioned guest rooms have private bath with hair dryer, in-room safe, TV, and phone. Mosquito nets are available upon request. Set against the backdrop of stunning Mt. Kilimanjaro in the midst of Amboseli’s rolling grasslands and savanas, Amboseli Serena Safari Lodge offers a classic safari experience. The lodge, built with eco-friendly materials, blends in the natural environment and reflects traditional Maasai motifs, colors, and textures. Amenities and activities include dining area, outdoor pool (fed by the waters of ice melt from Kilimanjaro), natural timber game viewing decks, watering holes for the animals, jogging trails, nature walks, bird watching, cultural talks, massage and spa services, library, gift shop, internet access, and laundry service. Guest rooms, outfitted in traditional Maasai style featuring beadwork, gourds, and hand-painted murals, have private bath with shower, hair dryer, in-room safe, ceiling fan, mosquito nets, and offer uninterrupted views of the game-filled plains. Sitting high above the waters of Lake Manyara, this 54-room lodge reflects the stellar birdlife that abounds here, with an architectural motif of swooping avian curves and the traditional concentric patterns of traditional Maasai boma (encampments). Lodge facilities and amenities include an outdoor pool, massage and beauty services, gift shop, library with books on Africa, internet access, board games, safe deposit boxes, and laundry facilities. Guest rooms have private bath with hair dryer, in-room safe, private verandas with lake views, mosquito nets, and phone. Located within Kenya’s richest game reserve, Masai Mara, the Sarova Mara Game Camp features 73 well-outfitted tents for a comfortable bush experience in keeping with the natural surroundings. The camp sits atop a slight elevation flanked by two streams, offering outstanding views of the Mara’s vast plains. Camp amenities include an indoor/outdoor restaurant; bar with fireplace; internet access; outdoor pool; massage and spa services; and laundry service. Guests can enjoy such activities as game drives, bird watching, nature walks, traditional Maasai entertainment and cultural lectures, and optional game-viewing balloon rides (at additional cost of $450 per person; cash or credit cards are accepted). Private tent accommodations all have en suite bath with shower, permanent roofs, zip-up fronts, mosquito nets, and electricity. James Earl Jones narrates this dazzling 40-minute IMAX documentary of the migration of wildebeest in the Serengeti and Masai Mara. A colorful shaded relief map at a scale of 1:2,000,000. A concise guide to local customs, etiquette and culture. The perennially best-selling tale of a naive young woman who leaves Denmark for East Africa, Dinesen’s (AKA Karen Blixen) autobiography draws us into life on a struggling coffee plantation. It’s a moving story inspired by a love for Kenya and its people. Includes the novella Shadows on the Grass. Sara Wheeler captures the romance and adventure of 1920s-era East Africa in this winning biography of Denys Finch Hatton, the handsome gadabout, daring bush pilot and companion of Baroness Blixen and Beryl Markham. A veteran safari promoter shares stories from Africa’s top safari guides. Cazenove’s 24 tales introduce some of the passionate adventurers, nature-lovers and ardent conservationists that make safari-going so rewarding. Illustrated with photographs and drawings by Jonathan and Angela Scott, this new edition of the tale of a pride of lions in the Masai Mara includes a chapter bringing the story up to date. This photo guide by two safari guides focuses on the lions, cheetah, leopards, zebra, giraffe and other celebrated wildlife. A compact guide to the birds and mammals, reptiles, insects and plants of East Africa, featuring a very good selection of large color photographs.